A filet mignon is a beef cut taken from the smaller end of the tenderloin of an animal, usually used to make steaks. This beef is a little expensive as compared to the meat from other parts of an animal’s body. Despite the high price of filet mignon at the local meat shop, it is economical to broil your own steak than than ordering it at a restaurant. Utensils: Grill, Cast-iron skillet, Hot pad, Spatula or tongs, Paper towels, serving dish. 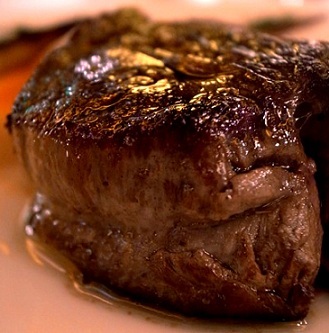 The first step in making your own super delicious filet mignon is buying the right meat. Go to your local meat store and buy the filet mignon of the cattle of your choice. Black Angus is always the right choice, but you can go for any other animal of your choice, including cow, buffalo or sheep. If you have bought a refrigerated steak, allow it to come to room temperature. Broiling a chilled filet would not make a juicy stake. Pat your chilled filet dry with a paper towel and let it sit on the counter for half an hour. Again pat dry with a clean paper towel. Season your filet mignon with freshly grounded black pepper. You can also add ginger, garlic paste and granulated rosemary, but keep it light, otherwise it will cover the natural flavour of your filet. Do not add salt at this stage, it will pull the moisture out of your filet. Sprinkle a pinch of salt once you are done broiling your steak. Preheat your grill to sear the stake. Your grill will be ready when you will not be able to keep your hand a couple of inches above it for more than a two to three seconds. If you are using a gas grill, it will be ready in 15 to 20 minutes. Once your grill is ready, put the filet on it and let it grill for 3 to 4 minutes. Don’t touch the filet, just let it sear. Turn the filet over with the help of BBQ tongs and allow it to cook for another 3 to 4 minutes. Once your steak has been caramelized, wrap it in a foil and let it rest for 10 to 20 minutes. This will allow the juices to redistribute in the meat.